Bollywood in its more than 100 years of existence has given us diverse films. Be it love story or horror, action-thriller or biopics, there have been great movies that we revisit time and again. But one genre of films that get etched in our memories for long is comedy. Yes, nothing more do we want than a good comic filmography in our laptops and phones. Are you looking for some comic relief? Do you intend to de-stress yourself? Well, this weekend why not have some fun and go on a comic spree, a ride of laughter and jokes with Hindi cinema? Who is Karishma? Who is Raveena? Is Karishma Raveena or is Raveena Karishma? Who is Ram Gopal Bajaj and how is he different from his twin Teja? Amar and Prem are looking for a rich bride, but their fate will be decided at the end. This Rajkumar Santoshi cult classic is surely the funniest and tops the list of best comedy Hindi films of all time. Don’t go too near to Crime Master Gogo, your eyeballs will soon be marbles! Remember Chatur’s speech at Teacher’s day? Sure, we all went crazy and laughed out loud. The funniest sequences in this film will give an ache to your bowels. We all know that when a friend fails it hurts but we surely know that when he comes first, it hurts even more. Got it, right? Starring Ajay Devgan, Arshad Warsi, Sharman Joshi and Tusshar Kapoor, this film is a laughter ride in itself. A must in your list if you want to go ROFL! This is a laugh-riot in every frame. 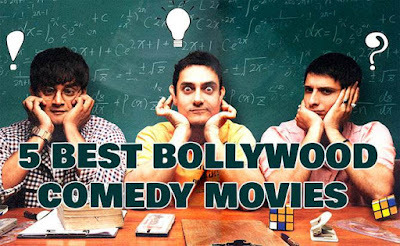 We all know how great Paresh Rawal’s comic timing is but when coupled with dramatic confusions, a love triangle of Aftab Shivdasani, Akshay Khanna and Rimi Sen, you’re going to enjoy a laughter roller coaster. A 3 hour only–laughter experience and complete madness! Akshay Kumar, Sunil Shetty and Paresh Rawal, all are great comedy kings. How can we forget the character of Babu Rao when we talk of funniest Hindi films of all time? Hera Pheri shouldn’t be missed this weekend if you are looking for a stress reliever.